Our Snohomish and Centralia antique malls (highlighted below) anchor their historic districts many antique shops and malls. Deciding on the antiques capitol of Washington might be compared to an ill-prepared schoolboy attempting to recall that state’s capital city (the correct answer is Olympia). Several Washington towns lay claim to the antiques-capitol title, and have the credentials to support it. Ten miles east of Tacoma is Puyallup, which was founded in 1877, a dozen years before Washington was admitted to the Union. The town is named for the Puyallup Indians, who lived in the surrounding valley. The community’s historic downtown is home to seven antique shops and malls. Linda and Stan Febus opened Cabbages & Kings Antiques downtown at 110 S Meridian St a year ago, after operating an antique mall on the outskirts of town before that. “We try to have something for everyone. We have some nice high end furniture… and a little primitive and shabby chic,” said Linda, who continually adapts their inventory to public demand. “We’re always guessing what they want,” she said. The Puyallup Antique District Association’s advertisements on televisions, in newspapers, and in trade publications, attract many customers from out of town, said Febus. A free walking map of the district guides visitors to the attractions. “All but one of the antique stores is within a five-minute walk,” she said. Around the corner, at 110 W Main St, is Kings Row Antiques, which Debbie and Stan Torgerson opened four years ago. Debbie described their business as a traditional antique store. “We like to interact with the public We like the old fashioned way, “ she said, adding that they never sell on eBay. Kings Row inventory includes glass, pottery, jewelry, linens and furniture. “We like unusual things and specialize in unique items nobody else can find,” said Debbie, who hopes to rebound in 2007 from an off year. Certain to draw more antique buyers to Puyallup is Palmer Wirfs & Associates antique show, formerly held at the Tacoma Dome. The 500-space show was held at Western Washington Fairgrounds for the first time in November and will return February 3-4, 207. “It’s a more convenient location with free parking for exhibitors and customers and easier access to the facility itself. It just worked as a better facility for a small to medium size antique show,” said Chuck Palmer, the husband of the show promoter Christ Palmer. Another of Palmer Wirfs’ events, which are named America’s Largets Antique & Collectibles Shows, is held annually at the Clark County Fairgrounds Exhibit Hall in Vancouver WA. This year’s 480-space show took place over the weekend of Jan 13-14. 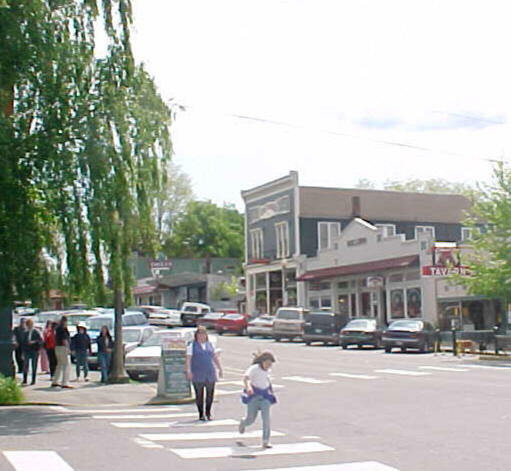 Centralia, midway between Portland and Seattle, has a concentration of antique shops in its business district, but none is larger than Centralia Square Antique Mall. Approximately 85 dealers rent space on three levels of the former Elks Lodge, a Mission Revival edifice built in 1920. Centralia Square Antique Mall, 201 S Pearl St, opened in 1986 after the Elks migrated to a new grounds. Antique furniture fills the ballroom on the upper level. General antiques and collectables take up the first floor. The Collector’s Bookstore and additional dealer spaces comprise the mezzanine level. Berry Fields Café is open during the mall’s business hours. “The mall is noted for its glass- Depression and Elegant- as well as pottery. People come from al over the United States mainly for our glass,” said manager Connie Mullins. Carl Smith opened Antique Liquidators in Seattle on June 9, 1970, with $389.50 in capital. Today it is a multimillion dollar business dealing mainly in furniture, which he imports from England, Denmark, Belgium, and Indonesia. Smith said the Seattle market is strong for affordably priced vintage furniture. “Its hard to compete against a beautiful 1910 piece of oak furniture from England or America. The quality is there,” he said. About 5 percent of pieces he sells are reproductions from India. “There are some things you’re just not going to get in the antique trade, which you can pick up easily in the reproduction business,” he said. About 70 percent of Antique Liquidators’ sales are to retail customers at the store at 503 Westlake Ave, five minutes north of downtown. Smith maintains an additional warehouse location for wholesale customers. Snohomish, 30 miles north of Seattle, has an historic waterfront business district, where about 500 dealers showcase their wares in three antique malls and numerous shops. Star Center Mall, 829 2nd St, which occupies a 1920s armory at the east end of Snohomish’s antique district, opened in 1982 and is home to about 200 dealers. “It was the first antique mall of our size in the Northwest,” said Tim Regan, who bought the business with his wife, Holly, in 2003. The mall carries a broad range of high-end glass and pottery, artwork, ephemera, militaria, primitives. The Regans do no not allow reproductions or new merchandise to be sold at their mall. They even guarantee the authenticity of what they sell. “We’ve found that as long as we police our shelves well it doesn’t occur very often, but when it does we take care of it,” said Tim. Star Center Mall has a reference library consisting of hundreds of books, which are available for public use and for sale. “We have a lot of folks who bring collectibles to the mall and we help them figure out what they have by going through the book,” said Regan. Collector’s Choice restaurant is also located at Star Center Mall. Spokane, nearly 300 miles inland, boasts numerous antique malls and unusual shops. Among the larger establishments is Vintage Rabbit Antique Mall, 2317 Monroe St. Owner Jan Richart started out small 12 years ago and steadily expanded the store. She eventually bought the building, which is home to 30 dealers. Vintage Rabbit Antique mall adheres to a 1960s or older timeline to promote higher-quality merchandise, which ranges from furniture to smalls. Finders Keepers was repeatedly voted Spokane’s best antique store in various consumer polls, but owner Deena Caruso began specializing in vintage jewelry when its sales surpassed that of her other merchandise. “It just kept selling, so I kept reinvesting in the jewelry,” said Caruso. Today, Finders Keepers Jewelry Galore features Spokane’s largest selection of vintage jewelry. Organized according to type, era, and color, sections include Victorian, vintage rhinestone, old Mexican sterling, ‘50s plastic, vintage metals from the ‘60s and ‘70s, and men’s jewelry. Caruso employs designers who create unique earrings from old pieces of jewelry. “I hear people from all over who say they’ve never seen anything like the store,” said Caruso, whose background is in marketing and retail. Finders Keepers is located in a 100-year-old storefront at 112 S Cedar St, in an historic district west of downtown known as Browne’s Addition. Caruso opened Finders Keepers Fashion Flashback in an adjoining storefront in September, specializing in vintage clothing. Caruso said 2006 was an outstanding year for her business, with sales up 20 percent over the previous year. Debbie Roffler describes her Main Street Antiques as a colorful Bohemian type of store. “We have a lot of ethnic pieces from around the world, one of a kind things. There’s a lot of Native American, a lot of Persian rugs. It’s not a typical antique store. When people walk in they say ‘Oh my…,’”said Roffler, one of four dealers who sell there. Main Street Antiques is located at 7 W Main St at the corner of Division Ave in an old hotel that had been a mission house. “The neighborhood has changed a lot in the last five years since I bought the building. A lot of people have been moving into the neighborhood and cleaning up. It’s a f un little neighborhood now with artsy and funky little shops and restaurants,” said Roffler. Main Street Antiques’ proximity to the Spokane Convention Center and nearby hotels brings in many customers from out of town. “Don’t miss us,” said Roffler. Macon Brothers Auctioneers of Walla Walla celebrated its 100th year anniversary of sorts last year. While Doug and Mike Macon founded Macon Brothers Auctioneers in 1975, their grandfather, Daniel Francis Macon, started an auction service in Washington, Iowa, in 1906. Mike Macon retired in 1998, but Doug’s 22 year old auctioneer daughter, Emily Macon, is already a veteran on the team. She attended auctioneer school at age 16. The Macons are busy conducting farm, industrial and bankruptcy court auctions. They move most of their auctions to a modern facility at Walla Walla Regional Airport. “This past year we did two auctions facilitated by Proxibid. Those sales had things we thought would be of more national interest than just local,” said Doug Macon, adding that their company’s biggest growth last year was in real estate auctions.